I learned to ski just over 50 years ago. Back then, my Mom had to lace up my ski boots and help get me into my cable bindings. Skis were mostly still wood with metal edges screwed into them. It doesn’t seem so archaic to me but those technologies probably look as old to kids today as 9 foot skis with bear trap bindings looked to me back then. So, growing up, I was on some ski lifts that you almost never see anymore. Tow ropes – the glove manufacturers must miss those – the Poma lift – nothing like sticking a metal pole between your legs and being jerked up the hill to scare a young lad away from skiing – and the good old J-bar and T-bar which always claimed a few victims each time up the hill. Back then it was just as hard to learn to get up the hill as down. Sometime in the last couple of decades the ‘Magic Carpet’ conveyor was introduced on the beginner hills and it’s easy to ride. You just slide on and ski off at the top. Not much more skill needed than being able to stand for a couple minutes. The strangest/coolest place I’ve seen one is the Peruvian tunnel under Hidden Peak at Snowbird. The tunnel connects Peruvian Gulch on the North side of Snowbird with Mineral Basin on the South side. I rode it for the first time today and it was worth the trip. Inside the tunnel, you’ll see a bit of history of mining in the region and some old machinery. You can check all this out on the 4 or 5-minute ride through the mountain – if you’re at Snowbird don’t miss it. What about you? Have you ridden any unique lifts? Helped out on this slightly rainy day at the ‘Bikes for Tykes’ put on by the Salt Lake City Bicycle Collective. It was sponsored by Bingham Cyclery and several other local bike concerns. 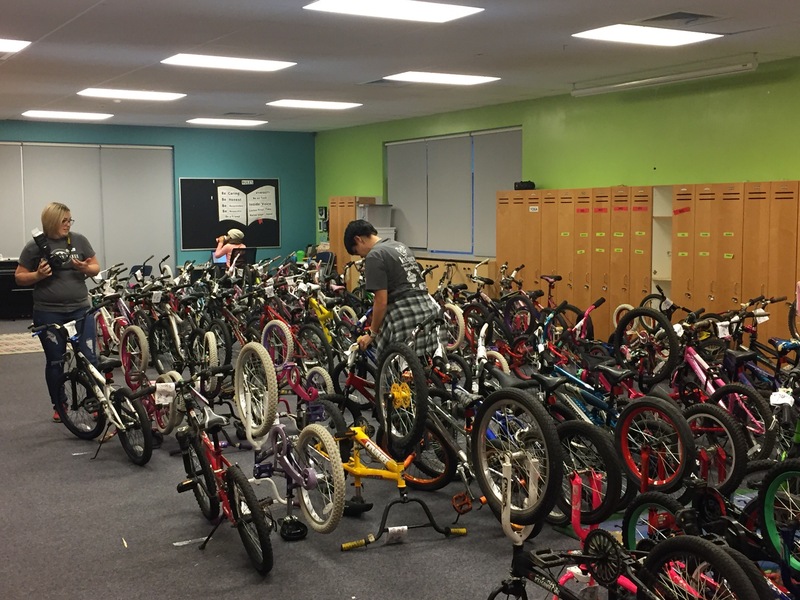 There is nothing like seeing a kid’s smile as he/she is presented with a new (or slightly used bike) and the joy they have pedaling around the playground afterwards. Sure put me in the Christmas spirit. I attended a City Council meeting here in Draper the other night. The topic was an emotional one as the City was proposing ‘surplussing’ (selling off) a few hundred acres of the 2400 acres it owned in order to help pay off some of the bond that was used to buy the land. I think it’s great that the citizens want to save all the land as open space and I don’t want to see more ugly development in this area. A group called ‘Save the Hollows’ had formed to fight the surplussing effort and has done a good job galvanizing opinion and getting citizens to the meeting. But the irony of what was said at the meeting was not lost on me – I can’t be the only one who noted the conflict. The quick summary of the public comments is basically: ‘I have my 2-acre lot with an amazing view, I don’t want to look at someone else’s house, and I want to preserve open space’. Or, ‘I came to Draper for the big lots and open space and don’t want to see it change’. Doesn’t anyone connect the continued development of large lots with the loss of open space? Draper has grown from about 7,000 people in 1990 to about 47,000 today and the city projects a 5% growth rate for the next 5 years. If the 5% growth rate continues that means the population will double to over 90,000 in about 15 years. The question for the citizens here (just like in many other areas) should be ‘Are you willing to live in denser developments to preserve open space and save some of these wild lands?’ But, I don’t see anyone grappling with this bigger issue. New development in the low elevation areas of Draper is fairly dense but what will happen in these areas bordering the wild lands? Do you have ideas about what to do? Will people change their home buying dreams? Will they live on a smaller lot in denser developments in order to preserve these wild lands?